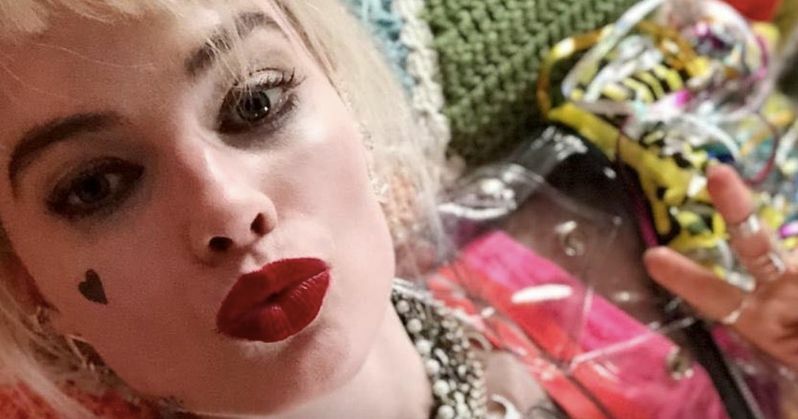 Harley Quinn star Margot Robbie has revealed the very first image of her character's return in the upcoming Birds of Prey. The DC movie has already begun principal photography, but it's quite possible this is Harley's very first day on set. Robbie made her debut as the Joker's girlfriend back in 2016's Suicide Squad. Despite the film fairing poorly with critics, fans couldn't get enough of the iconic Harley Quinn. She was such a big hit, in fact, that Birds of Prey is the first of (at least) four different projects that Harley Quinn is currently attached to at Warner Bros. and DC Films. And after getting a sneak peak at this first teaser image, fans will surely be jumping up and down in their seats for more. Margot Robbie revealed the first new look at Harley via the star's personal instagram profile. The selfie gives a great showcase for the character's wild style - filled with plenty of color and wacky designs. While we don't know too much yet about the plot of the movie, this image at least gives us a little bit of an idea of what to expect. Take a peak at Harley Quinn's return below. Along with Harley Quinn returning, the film will serve as an introduction to a number of other famous DC characters including Jurnee Smollett-Bell as Black Canary, Mary Elizabeth Winstead as Huntress, Rosie Perez as Renee Montoya, Ella Jay Basco as Cassandra Cain, and Ewan McGregor as evil crime lord Black Mask. Sadly we haven't seen looks at the film's other characters just yet, but that will surely be coming soon. With this teaser in mind, the anticipation will surely only grow now considering what the final product could really look like. Birds of Prey is being helmed by director Cathy Yan, who most recently made waves at Sundance last year with the dark comedy Dead Pigs. She is working from a script written by Bumblebee scribe Christina Hodson. Seeing that the movie is very female-centric, it's a relief that the production is also being overseen by women. Robbie is also serving as a producer on the film, so hopefully she will help everything stay on track. Birds of Prey could very well become one of the better installments in the DC Extended Universe. Warner Bros. and DC Films struck gold recently with the massive box office hit, Aquaman, but there's still plenty of growth needed if they want the DCEU to continue to thrive. The dark superhero universe has struggled to be consistent over the years, after having previous installments like Batman v Superman: Dawn of Justice, Justice League and the aforementioned Suicide Squad failing to match up to the success of competing Marvel films. But with the wide variety of talent involved in Birds of Prey, it definitely seems like they're on the right track. It's a gift that any movie featuring Harley Quinn has potential to be successful simply because of the character's darkly fascinating persona. And thankfully this first look at Birds of Prey makes it seem like they're taking advantage of that and treating the character properly. Birds of Prey (And the Fantabulous Emancipation of One Harley Quinn) is set to hit theaters on February 7th, 2020. This news comes direct from Margot Robbie's Instagram.